Expect a more ghoulish crowd this weekend at Villains Tavern. It all starts in downtown’s Arts District, where Villains Tavern is hosting A Dark Carnival, two nights of “freakish entertainment” taking place on Friday and Saturday throughout Villains’ indoor-outdoor space, as well as a “Red Light” tent in the adjacent parking lot. Bars inside Villains and the Red Light tent will be serving an array of handcrafted signature and seasonal cocktails, as well as Oktoberfest beers. The infamous Villains ‘Mix and Match’ beer and shot combo will be available at all bars for $9, or if you’re feeling like a vagabond, grab a $3 brown bag of Schlitz, Tecate or Bud Light. Guests can soak up the libations with offerings from several food trucks and Villains’ own menu. Imbibing won’t be the only thing happening in the Red Light tent. 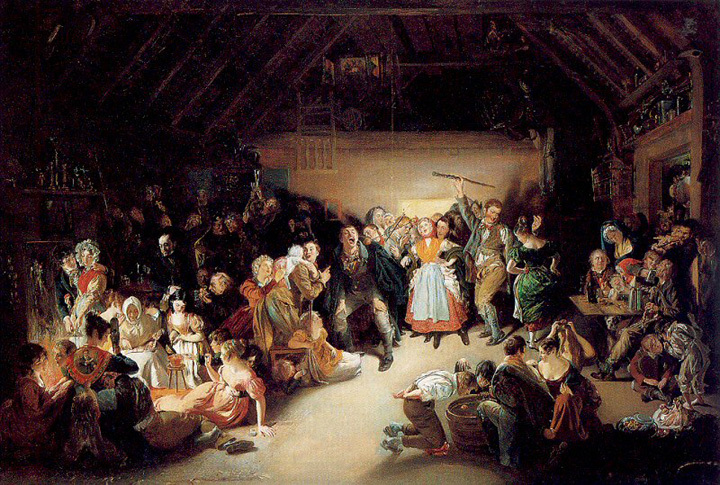 Once inside, guests will find themselves in the midst of a circus-like atmosphere of stunts performed by Circus Insidious, including fire, music, and magic shows. The Freak Show will shock and titillate all who enter and Tarot card readers and face painters will entertain the more faint of heart. 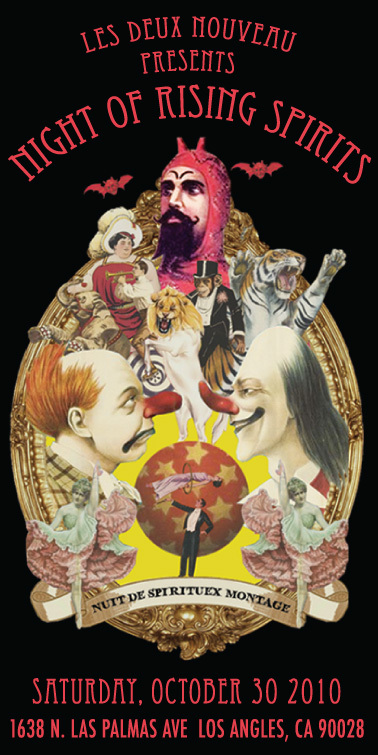 Entry to A Dark Carnival is free, including all live music events. A portion of proceeds from food and beverage sales will be donated to local non-profit organizations. 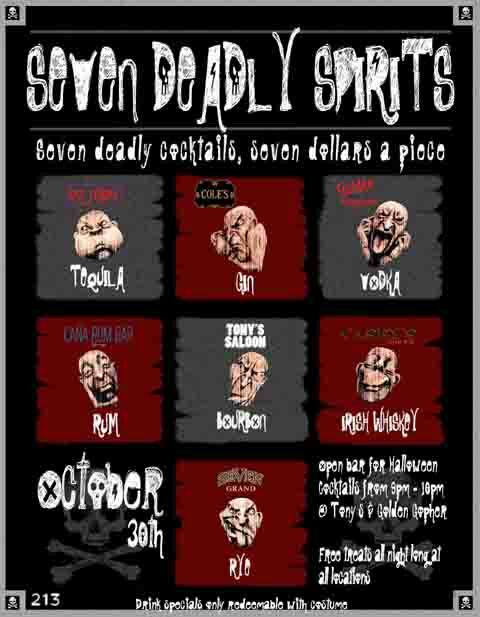 On Saturday, October 30th, seven is your lucky number when 213 presents Seven Deadly Spirits, a drink promotion taking place at Caña, Casey’s Irish Pub, Cole’s Red Car Bar, Las Perlas, Seven Grand, Tony’s Saloon and Golden Gopher. For guests in costume, each bar will offer a $7 Halloween cocktail celebrating one of Seven Deadly Spirits: rum, Irish whiskey, gin, tequila, rye, bourbon and vodka. Casey’s will quench your thirst for Bloody Molly’s and Irish whiskey while you rock to Adam West The Bat and Satellite Sky in the Jameson room. Cole’s Red Car Bar will offer the Corpse Reviver No. 2, a classic gin cocktail. Las Perlas: the tequila laced, “hell-hot” Diablo’s Paloma. Bourbon and vodka cocktails will be served at Tony’s Saloon and Golden Gopher, respectively. Tony’s and Golden Gopher will have open bar on their specials from 9-10pm, so early arrival is suggested. The Seven Deadly Spirits Halloween festivities and $7 cocktail specials continue on Sunday, October 31st at all the above bars except Caña and Las Perlas, which will be closed. For more information, visit 213downtown.la. UPDATE 10/28: 213 has announced a Deadliest Drinker Contest to go with its Seven Deadly Spirits weekend! The prize package includes poker chips redeemable for free drinks at 213 bars, and a rare bourbon bottled exclusively for Seven Grand, handpicked by 213 Proprietor Cedd Moses. Details at the 213 Facebook Page. 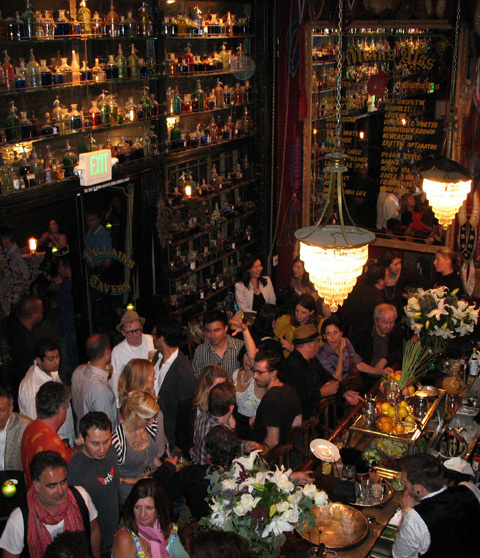 Also on Saturday is Night of Rising Spirits, taking place at Les Deux in Hollywood. The Host with the Most, Aidan Demarest welcomes guest mixologists Erick Castro (SF), Jennifer Contraveos (Chicago), Simon Ford (London), Grady Purtle (LA), Naomi Schimek (LA) and Damian Windsor (LA). To get your cocktail treats, you must RSVP and come in costume. Note that it will be a cash bar for this event. A portion of the door proceeds will benefit the International Rescue Committee, which offers lifesaving care and life-changing assistance to refugees forced to flee from war or disaster. To RSVP and for information and VIP table requests, visit nightofspirits2010.com. 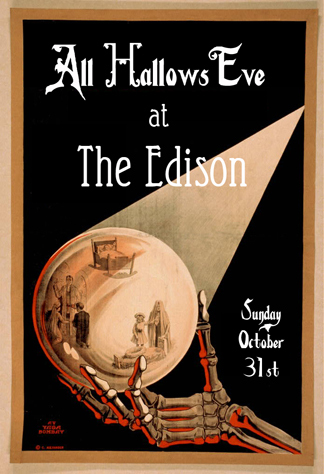 After closing for a private event on October 30th, The Edison will be back in action on Halloween Night, when it hosts All Hallows Eve on Sunday, October 31st. Descend into the subterranean venue and experience the Edison’s signature blend of crafted cocktails, live music and performances, and a steampunk setting that’s perfectly suited for a costume bacchanal. Call for table reservations and pricing.